The Supreme Court’s decision in the Janus case today carpet bombs the last remaining true protection for poor people and middle class workers. The Union movement made the American people in the middle 20th century the richest and most prosperous people in history. Our standard of living was the envy of the world. Our workers enjoyed better wages, benefits and more respect in their jobs when they had strong Unions looking out for them. A generation ago, that all changed. Ronald Reagan – himself a former Union president – betrayed the movement and fired the air traffic controllers, busting that Union. For the past 35 years, the Union movement has been under a withering, sustained assault by Republicans at every level of government and the private sector. And as the number of Unionized workers has fallen, so have our wages. So have our benefits. So has our standard of living. Workers today work longer hours for less pay than at any point since before the New Deal. Corporate CEOs and the executive class have never been doing better, and it’s directly because the only real check on their power – and let’s be honest, greed – has been eroded through nearly four decades of total class war by the richest and most powerful people against the rest of us. Democrats believe in Unions because we believe in workers. We know that our economy works best when workers have a real voice to negotiate. We feel it’s matter of justice that workers are worthy of respect, fair wages and comprehensive benefits. We know in our hearts that strong and healthy Unions mean a strong and healthy middle class. The American Labor Movement has seen tough days before. 150 years ago, powerful robber barons routinely called out the Pinkerton’s – the Blackwater of the 19th Century – and had Union organizers beaten, bombed and shot like dogs in the street. Those ideas are more resonant today than they have been in our lifetimes. And for those who believe that Unions won’t come back from this defeat, let’s remember the teachers who stared down right-wing knuckledragging Republicans in Arizona, Oklahoma and Kentucky just a few months ago. Let’s remember the Fast food workers and janitors and homecare workers who are organizing themselves every day. Let’s remember the hardworking federal employees who are going to heroic efforts, and taking on extraordinary risks, to keep doing their jobs despite unprecedented sabotage from their own government. And let’s remember, and redouble our support, for the Democratic candidates who champion Unions. 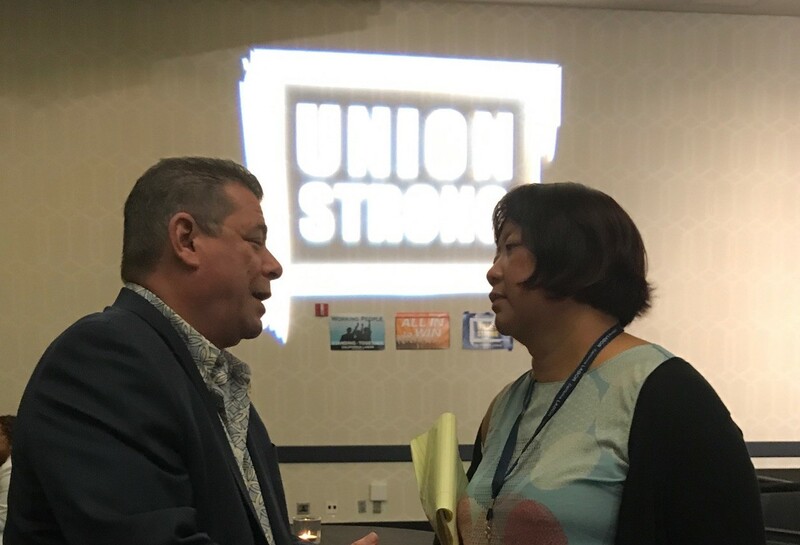 Let’s make sure they win back power, and unleash our own sustained effort to restore Union rights for every worker, while we reaffirm our Party’s unflinching support for The Labor Union movement as it once again comes back stronger than ever. As the old Union expression goes, an injury to one is an injury to all, and all of us are injured by this radical and regressive ruling. But we will absolutely resist and overcome.